The 1990s. An eerie, all-pervading shadow descends on the earth. The synthesisers and sequencers and samplers have taken over. Technical advances allow bad singers to have their false notes corrected by computers. Producers and entrepreneurs are the new superstars. Songwriters are banished into the past, where their old-fashioned skills are still valued, but they are now an underground movement. Talent is revealed as an abstract notion, a gift conferred on the naive but grasping, the desperately ambitious, by the new elite; the Technocrats. Panels of TV “experts” guide a gullible public in what should be considered good. A bleak, barren, shiny, antiseptic world masquerades as the entertainment industry. And at the same time, oddly, technology allows small-time individuals to create and make available their own little creations. 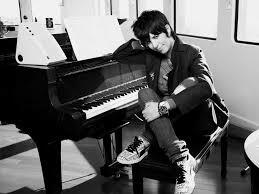 And then, out of the deafening darkness of high-tech production, there emerges a latter-day Aladdin’s Lamp of song who has been there all along: Diane Warren. She’s a strange woman, by all accounts. Writers of pop songs inevitably plough the fields of love and romance, but Warren’s life appears to have been notably short of those things. Even her mother has been quoted as saying she should stop writing for a while and get out more. Let’s start with Because You Loved Me by Celine Dion. The French-Canadian beanpole has a tremendously strong voice, but it’s nothing without killer material, and Warren specializes in that. Everybody goes to her when they need a hit. Even reformed rock bad boys Aerosmith, who no longer needed the money to buy cocaine and booze because they had given it up. They took I Don’t Wanna Miss A Thing into the dainty but lucrative environs of the pop charts. The man with the huge voice and matching hair (apart from a drastically receding front half), Michael Bolton, was furnished by Warren with How Can We Be Lovers (If We Can’t Be Friends). Incidentally, on a personal note I am very grateful for the intro, in which he sings the title, tipping me off so I have time to hit the off button before the song really gets going. Cher has always provided work for writers, and contributed to Warren’s bulging retirement plan with If I Could Turn Back Time. A relatively early hit for Warren was Rhythm Of The Night, a cheerful latiny hit for DeBarge in the days when Gloria Estefan ruled. If I haven’t said anything complimentary about Warren’s songs so far it’s because by and large I find them efficient rather than affecting. But they can’t all be like that, and sure enough there’s Toni Braxton’s Unbreak My Heart, which can take on a suitably noble, sob-worthy aspect after a few Merlots. Even better is country gal Leann Rimes with How Do I Live, which brandishes some real emotion amid the clever chord changes. So, we may not be able to think of any straight off, but there are hundreds of this woman’s songs in existence. Johnny Mathis, Tony Hadley, Jody Watley, Jimmy Barnes, Gary Barlow, Chicago, MeatLoaf, Deniece Williams, Joan Jett… The bountiful catalogue of Diane Warren is all around us. Ooh, a bit harsh on Ms Warren here but to be expected as we’ve moved on to new decades that I suspect you’re not as fond of – Glad you found that a few of her songs had redeeming features. The ones I like I really like, but I can’t help thinking she churns them out. So did HDH, of course, but somehow theirs seem a bit more heartfelt. I wasn’t even sure if I should feature her at all, but we can’t only write about things we like. Well, we can, but it does narrow the field a bit – Now that you’re heading towards the new millennium I can only wonder who is going to pop up next. Cathy Dennis springs to mind. I thought about her, and Brenda Russell, but no. There will be a sort of roundup on Wednesday and that’s it. Efficient is a good description. I had no idea she wrote “The Rhythm Of the Night” which is a very fun pop hit… Thank for educating me a bit about a very capable contemporary songwriter.